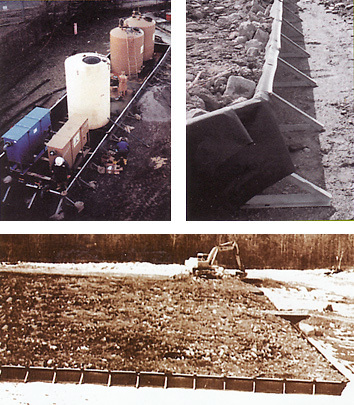 TerraStor containment systems are cost-effective answers for the storage and treatment of sand, clay and other earthen materials, and slurries. TerraStor components are rapidly assembled in areas where berms or other retaining devices are impractical or too costly. All parts can be conveniently trucked to location and bolted-together by workers using ordinary hand tools. A typical half-acre TerraStor with site-built earthen ramps for truck access, is generally completed within a day. A full range of membrane liners includes, XR-5, polypropylene, and polyethylene. These industrial-quality liners are designed to withstand physical damage and chemical corrosion. Modular components allow assembly of any size containment based on a 3’-9” module, 2’0” high. Walls are 20 gauge galvanized steel. Frames are 2” x 2” welded structural steel angle, hot-dip galvanized after fabrication. All fasteners are corrosion resistant.